Jermaine Jackson never achieved the same level of fame his brother and sister Michael and Janet did. 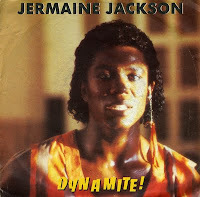 But at least one of his albums was pretty successful in various territories: 'Dynamite'. The album reached number 19 in the US album chart and number 57 in the UK. The title track was released as the second single from the album and managed to get to number 15 in the US Billboard Hot 100. It was successful in some European countries too. Further success would come to Jermaine with the next single, 'Do what you do' and the infamous duet with Pia Zadora, 'When the rain begins to fall'. 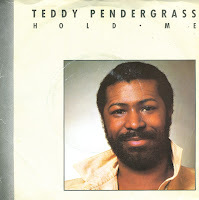 On January 13 this year, Teddy Pendergrass died as a result of colon cancer. He had a successful career in music throughout the Seventies and Eighties. He was originally a drummer for the Cadillacs, which soon merged with Harold Melvin & the Blue Notes. His first solo album was released in 1977. His biggest hit internationally was 1986's 'Hold me', a duet with Whitney Houston. The track featured on her debut album as well as Pendergrass's 1986 album 'Love language'. It reached number 22 in the Dutch Top 40 and number 44 in the UK singles chart. I recently saw a video of Whitney Houston on the UK television programme 'X Factor'. Her new song was quite horrible, she almost lost the top of her dress and she looked quite lost on stage, like she hasn't quite kicked her drug habit yet. It's easy to discard her entire body of work as sentimental crap and uninspired dance tracks. Even this one single I have from her now sounds very dated. 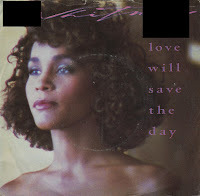 But 'Love will save the day' has a nice hook, even if the vocals are not the best and the music sounds very Eighties. the single was not Whitney's biggest hit, but still reached number 6 in the Dutch Top 40, number 9 in the US Billboard Hot 100 and number 10 in the UK singles chart.